The Jay Tamkin Band have played at many festivals, one particulary cool festival was in Austria with Eric Burdon & Todd Wolfe. Playing many instruments, you will often see Jay playing Lapjack, drums, guitar, bass & keys. So far in his musical career, Jay has played on two three week tours of the States & Europe many times, playing the bass at The Queen’s Golden Jubilee and with many Jazz greats including Jools Hollands Band colleagues Dennis Rollins and Pete Long. Jay Tamkin Band recorded 4 live tracks at Maida Vale studios, London for the Paul Jones BBC Radio 2 Blues Show, aired July 09. The band have opened or played with many named bands including Robin Trower, Eric Burdon, Todd Wolfe, Chris Farlowe, Madeline Bell, Pat Travers, The Blockheads, The Fabulous Thunderbirds, toured with Spookytooth in Europe, Stan Webb, Sherman Robertson, Ian Parker, Ruthless Blues, Ian Siegal, Buddy Whittington (John Mayall’s guitarist), Nine Below Zero, Aynsley Lister, MAN, Roy Ayers, Danny Bryant, Popa Chubby, Wilko Johnson, Nigel Kennedy, John Etheridge & many more. Jay Tamkin describes ‘Sorted’ his debut album on Wienerworld as ‘a documentary of my musical steps so far’. It’s a significant observation for whilst Jay is a guitarist and multi instrumentalist and grounded in the Blues – he’s got the song writing ability and musical chops to fulfil his huge potential in a very contemporary way. Indeed Classic Rock magazine recently likened the front cover of his album as resembling something from ‘the Madchester scene’, before commenting on his ‘instinctive guitar mangling’ and his ‘hip bucking grooves’. 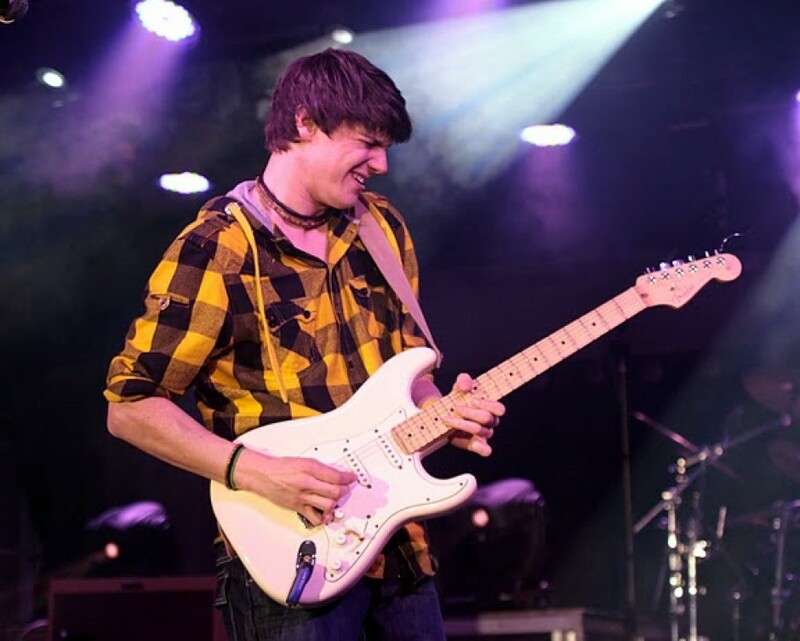 For make no mistake Jay Tamkin may be an up and coming rock/blues guitarist of the highest order but at heart he remains a fiercely independent musical spirit but firmly grounded in the blues. Influenced on the Blues side by SRV, Walter Trout and Albert and Freddie King, he cites Steely Dan’s Donald Fagen as being equally important influence on the Jazz side. Jay was further inspired by Paul Jones’ BBC 2 Blues show before finding his musical conduits in the shape of Popa Chubby and John Mayall’s guitarist Buddy Whittington. Significantly perhaps, he’s already managed to play with both of his heroes. Jay learned his craft in the best possible environment spending 6 years with the esteemed Devon Youth Jazz Orchestra as principal bass player, a position that enabled him to combine musical theory and serious practice with such musical heavy weights as Jools Holland, Dennis Rollins and Roy Ayers. It is the combination of his musical confidence, a surprising mature song writing style and a willingness to explore musical boundaries that makes ‘Sorted’ such an impressive debut album. ‘I was going for an eclectic mix of styles’ says Jay. But while there are some wonderful musical tensions pulling him in the diverse directions of rock, funk and acoustic flavoured Latino styles, it’s the blues that lies at his core. ‘I enjoy a lot of different contemporary music,’ says Jay, ‘but Blues takes real feeling and soul to express it properly. My songs tend to be little stories, based around real life experiences. In fact Popa Chubby virtually gave me the song ‘You Need A Woman’, when he gave me some much needed personal advice. I just transcribed what he told me into the lyrics of the song’ (laughs). In an era when guitar heroes have made a strong comeback, Jay Tamkin isn’t about to make his pitch solely as a guitarist. Rather it’s his rich musical persona that marks him out as unique. For while his restless imagination may push him into a variety of styles via some fiery notes and melodic grooves, JT is treading his own path. Indeed as his album title suggests he’s just about ‘Sorted’.